The Montpellier Snake (Malpolon monspessulanus Hermann, 1804) is a large snake that can reach a total lenght of 2.55 m, although it rarely exceeds the size of 2 m, making it the largest snake in Europe. It is a diurnal snake. Its density is generally about ten individuals per hectare. 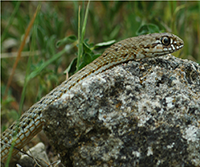 It is the only venomous colubrid species found in France. Its venom is not very toxic. Although it is venomous, only a few cases of envenomation of humans are known, one of which occurred when a finger was inserted into the snake's mouth. The Montpellier snake is not a dangerous snake for humans. It does not have hooks running like the viper. This snake breeds from April to June, laying females from 4 to 14 eggs in a pile of leaves or stones. If it is cornered or feels threatened , it can sometimes stand like a cobra , blow strongly to impress his opponent and , ultimately balk and bite. The animal is not threatened by its interactions with humans and is assessed as "Lest Concern" but it is often killed by cars and farmers (Wikipedia). The Aesculapian snake (Zamenis longissimus Laurenti, 1768) is a nonvenomous snake native to Europe. With up to 2 meters in length, it counts among the largest European snakes, though not as massive as the Montpellier Snake. The snakes hatch at around 30 cm (11.8 in) and average at around 110 cm (43.3 in) to 150 cm (59 in). The species has been of cultural and historical significance for its role in ancient Greek and Roman mythology and derived symbolism. The Aesculapian Snake prefers forested, warm but not hot, moderately humid but not wet, hilly or rocky habitats with proper insolation and varied but not sparse vegetation that provide sufficient variation in local microclimates, helping the reptile with thermoregulation. They generally do not avoid human presence, being often found in places such as gardens and sheds, and even prefer habitats such as old walls and stonewalls, derelict buildings and ruins that offer a variety of hiding and basking places. Their main food source are rodents up to the size of rats and other small mammals such as shrews and moles. They also eat birds as well as bird eggs and nestlings. The snakes are active by day. In the warmer months of the year, they come out in late afternoon or early morning. They are very good climbers capable of ascending even vertical, branchless tree trunks. 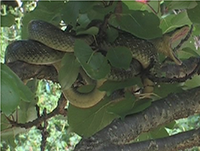 The snakes have been observed at heights of 4--5 m and even 15--20 m in trees, and foraging in the roofs of buildings. The average home range for French populations has been calculated at 1.14ha, however males will travel longer distances of up to 2 km to find females during the mating season and females to find suitable hatching sites to lay eggs. The Aesculapian Snakes are deemed secretive and not always easy to find. The name Aesculap refers to the classical god of healing (Greek Asclepius and later Roman Aesculapius) whose temples the snake was encouraged around. It is surmised that the typical depiction of the god with his snake-entwined staff features the species. Later from these, modern symbols developed of the medical professions as used in a number of variations today. 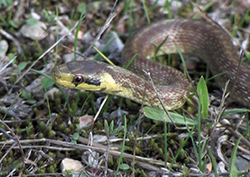 Though the Aesculapian Snake occupies a relatively broad range and is not endangered as a species. Among the key concerns is human-caused habitat destruction, with a series of respective recommendations concerning forestry and agriculture. The Hermann’s tortoise, (Testudo hermanni Gmelin, 1789) subspecies hermanni, a native of France, is a terrestrial tortoise and an endangered species. It lives in the Mediterranean region of Europe, in France only in the Var, mainly in the “Massif des Maures” and in Corsica. Populations are declining and the species is protected. In nature, the life expectation of the Hermann’s tortoise is about 40 years. It develops sexual maturity around 12 or 13 years. On average the female lays 1-5 eggs. Like all turtles, this cold-blooded species must adapt its metabolism at the environmental temperature in order to have optimal activity. In cold months, they seek to protect themselves from the cold. If it's too hot, they shelter imperatively in the shade. This behavior varies depending on time of day and season. In nature, they can travel long distances to drink (about every 2 weeks in hot weather). Early in the morning they leave their night-shelter (they changing every night) and once they are warmed-up they go in search of food, leaves, flowers, fruits, sometimes snails and worms. At noon, when the sun is too hot, they hide in the bushes and come out at the end of the day. With an excellent sense of direction, they locate perfectly due to the Earth's magnetic field and the sun, and probably because they have a very good olfaction and memory of their environment. By late afternoon, they leave their shelter to feed again. In France, the Hermann’s tortoise is highly threatened by urbanization of the natural environment, forest and agricultural work and fires. Tortoises are attached to their place of living that is why they always try to return if removed by man. Some of those who survived the fires of 2003 were seen returning to their old habitat or continuing to be there despite its devastation (during the fires, they probably have been along the river, or in unaffected areas of fire). In Mediterranean natural areas, tortoises dig their hibernation shelter beneath a bush, and change from year to year, even if they seem still overwinter in the same area of their home range. They hibernate from mid-November to mid-March. Their heart rate and breathing are significantly lowered. They do not sleep properly speaking, but rather stay in a kind of lethargy. Captive turtles do also overwinter, a vital need for them. Released tortoises from captivity have dented scales so-called "dragons back." This deformation of the shell is due to malnutrition, often observed in captured specimens. It’s not desirable to release tortoises from captivity, in order to avoid hybrids. The CEEP coordinates an investigation in the Var and Corsica, to better understand the ecology of the species in order to protect it. You can participate in the survey (see French pdf). The European pond turtle, also called the European pond terrapin (Emys orbicularis Linné, 1758), is a long-living freshwater species of turtle. It is found in southern and central Europe, West Asia and North Africa. In the early post-glacial period, the pond turtle had a much wider distribution, being found as far north as southern Sweden. Emys orbicularis turtles prefer to live in wetlands surrounded by a large proportion of natural, wooded, landscape. Specimens of Emys orbicularis are also found in upland environments for feeding. Emys orbicularis is usually considered semi-aquatic, as their terrestrial movements can span 1000 meters, and occasionally found traveling up to 4000 meters, away from the water. The European pond turtle is a medium size turtle and varies quite a bit across its distribution, from 12 to 38 cm length. Due to evident patterns of sexual dimorphism, Emys orbicularis adult males are always found to be smaller than females. Emys orbicularis turtles eat a mixed diet of plants and animal matter that can increase the efficiency of their digestive process. Although it is assumed that Emys orbicularis turtles are strictly carnivorous, it seems that not all Emys orbicularis are entirely carnivorous as their diet also consists of plant material. 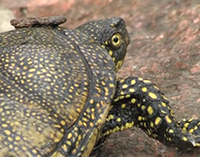 Most freshwater turtles lay their eggs on land, typically near a water body, but some species of Emys have been found to lay their eggs distances less than 150 meters from water. The search of a nesting areas by adult females can last several hours to more than one day. Once the location of the nest is established, females spend time for the construction of the nest, laying of the eggs, and closing the nest which can take up to another 4 hours. Emys orbicularis species have become rare in most countries even though they are widely distributed in Europe. The building of roads and driving of cars through natural habitats of Emys is a possible factor that threatens the populations of the European pond turtle. Road networks and traffic often carry complex ecological effects to animal populations such as fragmenting natural habitats and creating barriers for animal movement. Mortality on the road is most likely due to females selecting nests near roads which places a potential danger for the hatchlings as well. Life span is 40--60 years. They can live over 100 years but it is very rare and unusual. (Wikipedia).